Intersecting Circles, Diameter, Secant, Chord, Collinearity. Square, Angle Trisector, Diagonal, Regular Dodecagon, Area, 30-60 degrees. Quadrilateral, Diagonal, 45 Degrees, Angle Bisector, Isosceles Triangle, Congruence. Triangle, Cevian, Incenters, Sum of Angles, 270 Degrees. Two Squares Side by Side, Perpendicular, 90 Degrees, Angle. 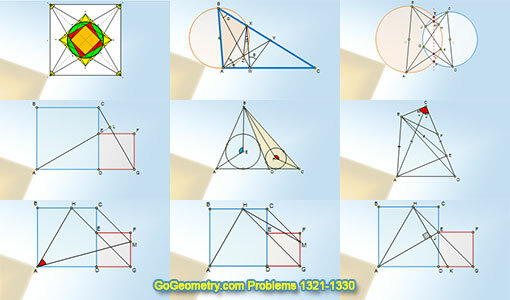 Typography of Geometry Problem 1327. Two Squares Side by Side, Perpendicular, 90 Degrees, Congruence. Two Squares Side by Side, Parallel, 45, 90 Degrees.